Desde su formación en 2012, The Spook School han estado cada vez más comprometidos con la escena DIY queer punk, tomando como inspiración las ideas afines de toda la gente que han ido conociendo a lo largo del camino y también de bandas como Martha, Joanna Gruesome, Trust Fund y Tuff Love. Su último disco, “Try To Be Hopeful” (2015), con influencias de los Buzzcocks, T-Rex y el C-86 más ruidoso, es un álbum con un sonido más potente y atrvido, que intenta reflejar el sonido de la banda en directo, ayudados por el productor MJ, de Hookworms. Es un disco ruidoso, melódico y lleno de canciones pop que hablan acerca de la identidad, la sexualidad y cómo ser lo más. Su disco de debut, Dress Up (2013), recibió los elogios de medios como The Guardian, Uncut y Loud and Quiet. Incluso han visto su música en televisión, grabando la sintonía para la serie de la BBC Three “Badults” (Adam, Anna y Niall hacen sus pinitos en el mundo de la comedia), y también han girado por Estados Unidos, donde fueron protagonistas de un documental de la Rolling Stone y conocieron a Laura Jane Grace de Against Me! Try To Be Hopeful es el sonido de una banda que crece, aferrándose a sus identidades y cargando contra el mundo. Pero en mitad de la lucha para que todos tengamos un lugar en la sociedad, aún hay hueco para el amor, la amistad y la diversión. Con sus himnos atrevidos, efervescentes y electrizantes, The Spook School son el chute de optimismo que habíamos estado esperando. 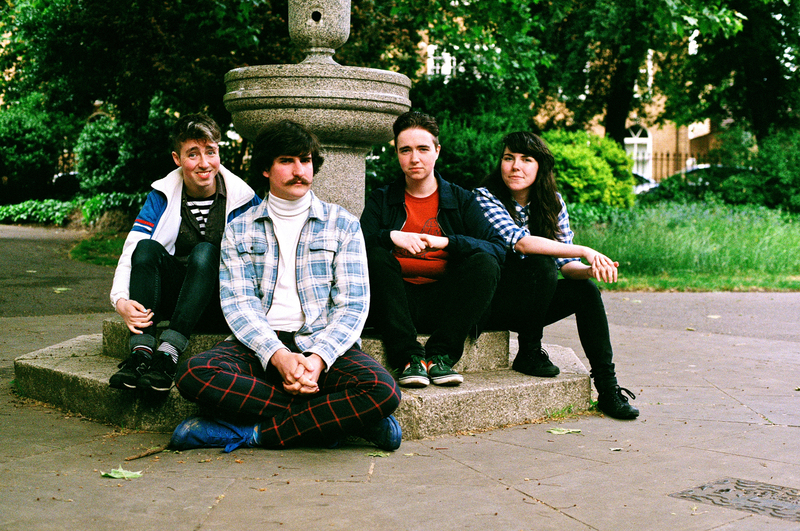 Since forming in 2012, The Spook School have become increasingly involved with the DIY queer punk scene, taking inspiration from the passionate, like-minded people they’ve met along the way, and from bands such as Martha, Joanna Gruesome, Trust Fund and Tuff Love. Their last album, “Try To Be Hopeful” (2015), influenced by Buzzcocks, T-Rex and the noisier end of C86, is louder, bolder, fuller-sounding and captures more of their live sound—aided and abetted by producer MJ of Hookworms. It is brim full of noisy, tuneful and triumphant queer pop songs about identity, sexuality and being awesome. Their debut album, Dress Up (2013), received plaudits from the likes of the Guardian, Uncut and Loud and Quiet. They even have seen their music used on TV, having recorded the theme tune for BBC Three series “Badults” (Adam, Anna & Niall all have sidelines in the world of comedy), and have also toured the US, where they became the subject of a Rolling Stone documentary and met Laura Jane Grace of Against Me!. Their songwriting is split between all four members, giving a different perspective and energy to each song. “Richard and Judy” talks about conservatism and how easy it is to accept that this is what “normal” is and how schools are (as Adam explains) “such horrible little places of enforced heteronormativity”. The opening track, “Burn Masculinity”, is an empowering anthem for our time that challenges male privilege. “I Want To Kiss You”, captures the excitement and anticipation of meeting someone, thinking they’re the most interesting person ever and not wanting to wait to see them again. “It’s totally about kissing people,” concludes Nye. Try To Be Hopeful is the sound of a band growing up, embracing their identities, and taking charge at the world. But amidst the fight for a place in society for everyone, there’s still time for love, friendship, and fun. With their bold, fizzy and electrifying anthems, The Spook School are the shot of optimism we’ve been hoping for.